After working with luxury Italian brands for many years, Jordin Martin fell in love with the Scandinavian way of life. He began to explore their design and heritage, and realised that the area was spawning a new generation of young designers that offered smart, beautiful and affordable products. Seeing that these brands and designers aligned with his own personal ethos, Jordi decided to open a shop in Barcelona that would showcase their work. 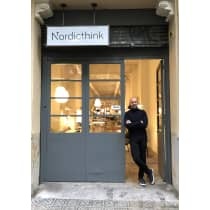 Nordicthink was the result, and is now a key shopping destination for the city's fans of minimalist design. "Our concept is strong and pure, and as we say we "always look to the North". However we do try to filter our Scandi inspirations through the lens of Barcelona's distinctive aesthetic, creating a truly unique style."